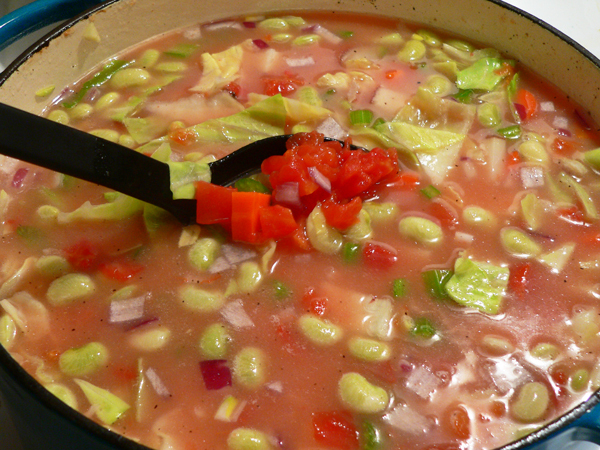 Follow our complete, step-by-step, photo illustrated recipe to make this delicious home made soup. I hope you’re saving those ham bones from your holiday hams, its just what you need for this soup. Ham hocks can be used instead though if need be. Printable recipe included. You ARE saving those ham bones leftover from your holiday hams… right? If you are, here’s a great way to turn them into a delicious pot of homemade soup. Ham Bones are a perfect seasoning for this. We’ve already seen two snowfalls here in the heart of Carolina in this first month of 2018. And, nothing makes a cold day, or a snowy super-cold day, any better than a bowl of hot homemade soup. The nice thing about this (and most soups) is that you get the chance to use up those leftovers you have lingering around in your refrigerator. You can even mix those with fresh vegetables, canned vegetables, or even frozen vegetables. It doesn’t even matter if some of them have already been cooked. When the snow cleared away, I was ready to get outside after being “snowed in” for most of the week. We went from below freezing temperatures to near 70F temperatures in just a matter of a day or two, so it was the perfect chance to visit the North Carolina State Farmers Market over in Raleigh. That’s where I purchased the red potatoes, cabbage, carrots, and onion. I had a bag of frozen butter beans that had been in the freezer for awhile, and decided to use some canned tomatoes. 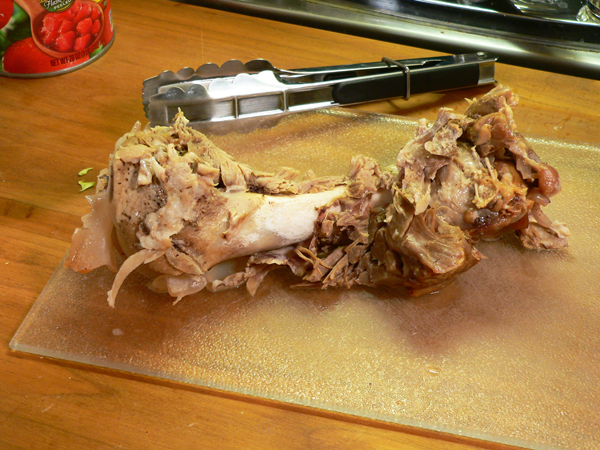 As for the ham bone, it was leftover from the Corned Ham recipe that I prepared recently. I’d trimmed it down pretty good, but it still had a little meat left on it, so I wrapped it in plastic wrap and foil and stuck it in the freezer so I could make soup later on. If you don’t have a ham bone tucked away somewhere, a smoked ham hock, even smoked turkey legs will work. Just change things around, use what you have, and make this recipe your own. Either way, it makes for a mighty tasty meal on a really cold winters day. I hope you’ll enjoy it. Ready to get started? Shovel the snow out of the way, head for the kitchen, and… Let’s Get Cooking. 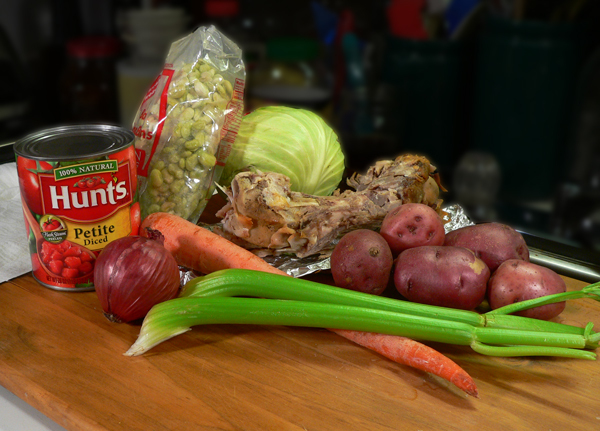 Ham Bone Soup, you’ll need these ingredients. These are just the vegetables that I’m using. 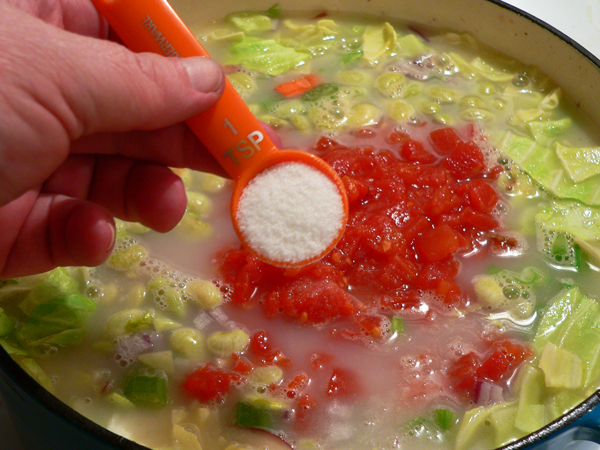 The really neat thing about this type of soup is that you use what you have on hand for the most part. It’s a great way to take advantage of leftover vegetables if your refrigerator is getting full. 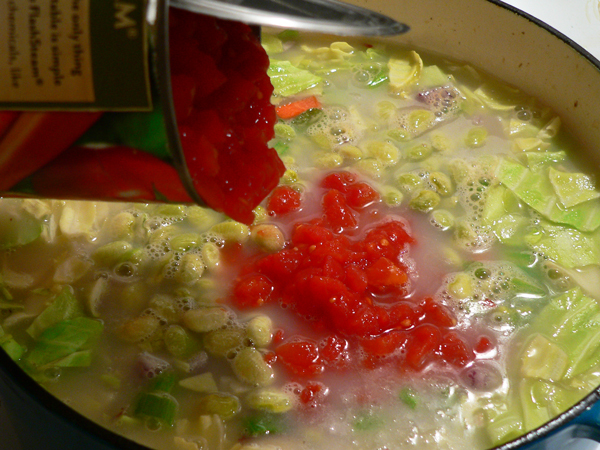 I purchased fresh vegetables for most of the recipe, but used frozen butter beans and canned tomatoes as pictured above. The ham bone is from my Corned Ham recipe posted elsewhere here on Taste of Southern. The ham wasn’t a smoked ham, so it has a bit of a different flavor just because of that. The leftover ham bone from your holiday hams will work great. You’ll need to have a thawed out ham bone of course. I took mine out of the freezer the day before I started this recipe. Place the ham bone in a large Dutch Oven style pot, one with a lid. Cover the ham bone with water. 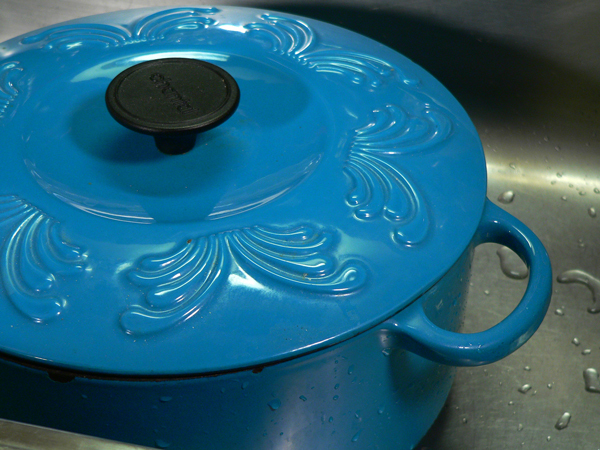 Place the pot over Medium heat on your stove top and let it come up to a low rolling boil. Once it starts to boil, set your timer and let it boil for one full hour. We’re using the bone and meat to make a broth for our soup. Wash your vegetables while the ham bone is boiling. I just rinsed mine under cold running water and let them drain in the colander. 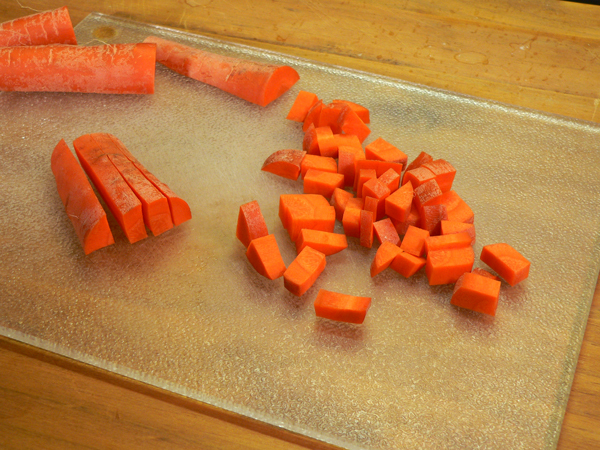 Use a sharp knife to dice up the carrots. Place them in a large mixing bowl. Dice the celery, place it in the mixing bowl. Cube up the red potatoes. I prefer smaller pieces as they will cook quicker. You need to keep all the vegetable pieces similar in size so they cook evenly. 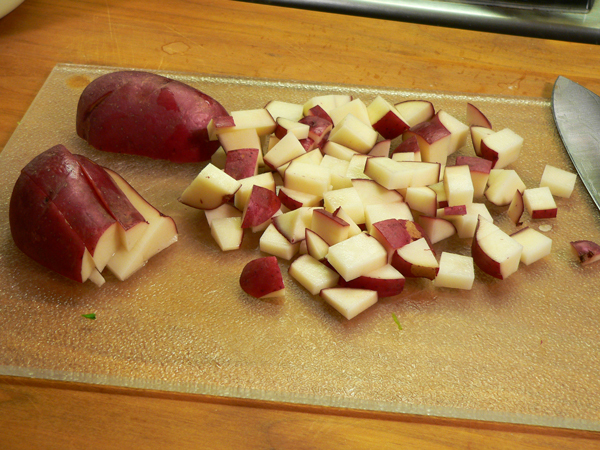 Place the potatoes in your bowl with the other veggies. 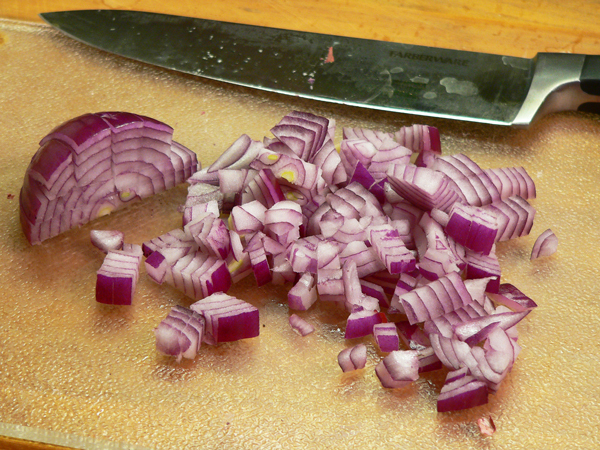 Dice the onions, cry a bit, and then add them to the vegetable bowl. Slice half the cabbage up into small bite sized pieces. I’m only using half of the small cabbage. You could of course use more if desired. Just be sure to cut out the hard center core and discard that. 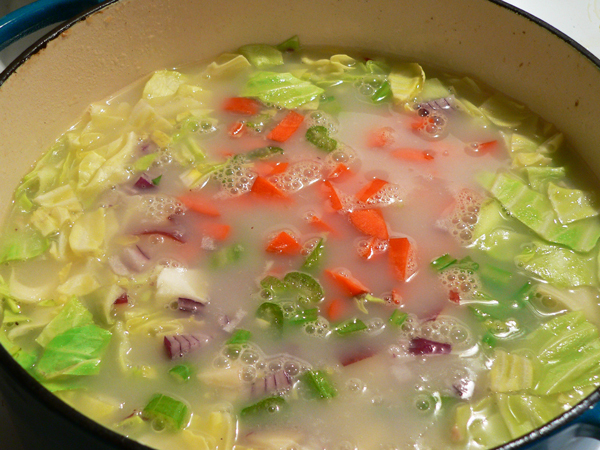 Add the cabbage pieces to your other vegetables in the bowl. Just set the bowl aside until needed. 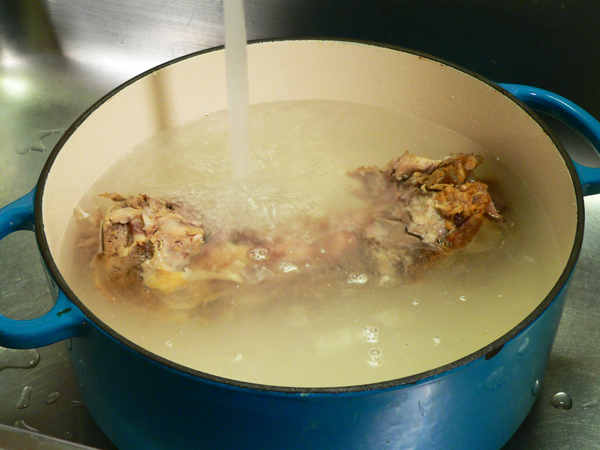 After the ham bone has boiled for an hour, remove it from the pot and set it aside to cool. Once it’s cooled, we’ll pull off the remaining meat that’s on the bone. A lot of the meat just fell off the bone when I went to pick it up. Smile. Add all the vegetables to the pot of broth. 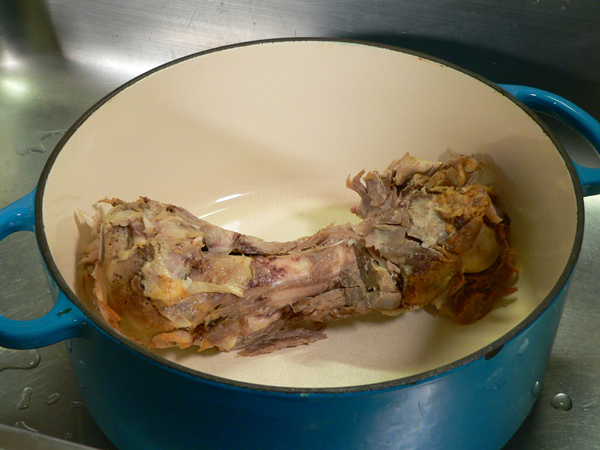 I had just a little over half a pot of liquid once I removed the bone. You might have more or less, depending on how you started. There isn’t really a right or wrong amount. I added about a cup of frozen butter beans at this point. They had been in the freezer for a good while so I figured it best that I go ahead and use them. You could add about any leftover vegetables that you might have on hand from a previous meal. If they’re cooked, that’s fine. It just reduces the cooking time for the soup. Make it your own, use whatever you like and have on hand. Next, I added the canned tomatoes. I wanted a little tomato in my soup, but it’s still not like my Homemade Vegetable Beef Soup that I posted some time back. Pork gives it a different flavor all together. And of course, you’ve got to have a little sugar. I’ve mentioned it before, but Mama always added a little bit of sugar to her vegetables. It’s just a habit that I’ve picked up on but it does always seem to help. I’m not adding salt until after the soup has cooked. My ham bone came from my Corned Ham recipe as mentioned previously. Since I had packed a bunch of salt down near the bones while making the corned ham, I’m not sure how much salt might already be in the ham bone. You can always add it if needed, but it’s difficult to recover if it’s too salty. Grab a big spoon and stir everything up really good. Now that the ham bone has cooled, pick the remaining meat off the bone. I didn’t have a lot as I had trimmed the ham pretty close when I was cutting it off the bone originally. Add the meat to the pot of vegetables and give it another good stir. Bring the pot back up to a low boil and let it simmer until all the vegetables are tender. Since I had a good amount of liquid covering my vegetables, I decided to leave the lid off the pot this time around so some of the broth could evaporate away. You can place the lid back on yours if you prefer. You’ll also need to taste the potatoes, carrots and other vegetables as they cook to make sure they all are tender. Mine took another hour to cook, uncovered, before the potatoes and carrots were tender. 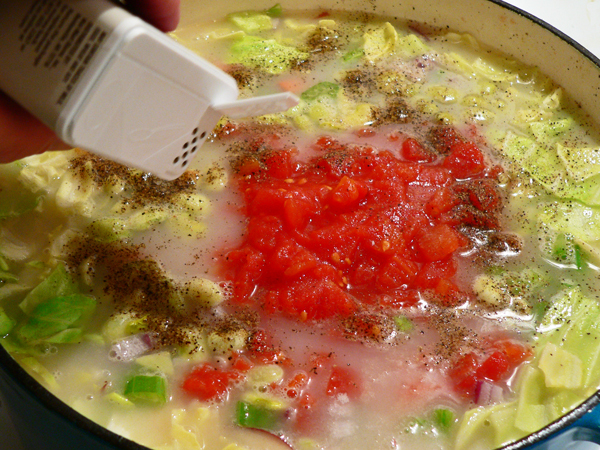 At this point, taste your soup to see if it needs any more seasonings like salt and pepper. 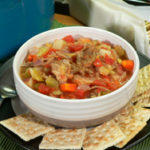 Follow our complete, step-by-step, photo illustrated recipe to make this delicious home made soup. 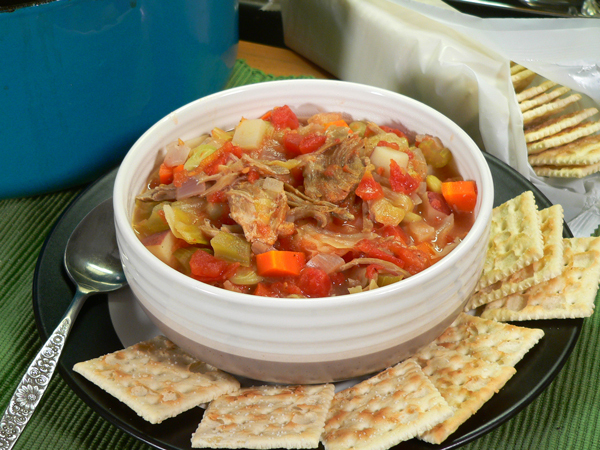 I hope you’re saving those ham bones from your holiday hams, its just what you need for this soup. Ham hocks can be used instead though if need be. 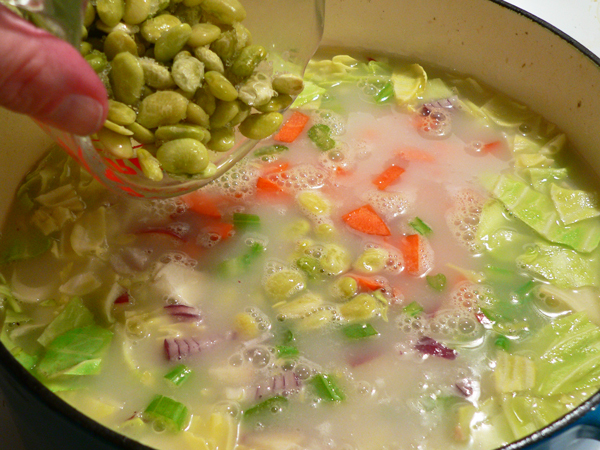 1 cup of Butter Beans (lima beans), cooked or uncooked. Salt, to taste as needed. Place ham bone in large Dutch oven pot, cover with water. Place over medium heat. Let simmer for one hour. Remove the ham bone and let it cool after one hour is up. 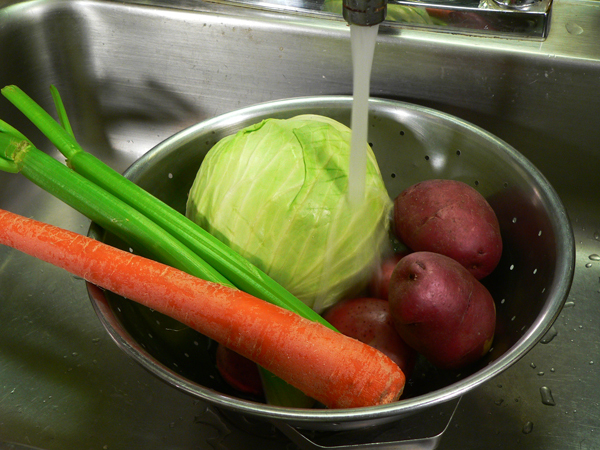 Rinse the vegetables under cold running water. Dice the carrot, add to the broth in the pot. 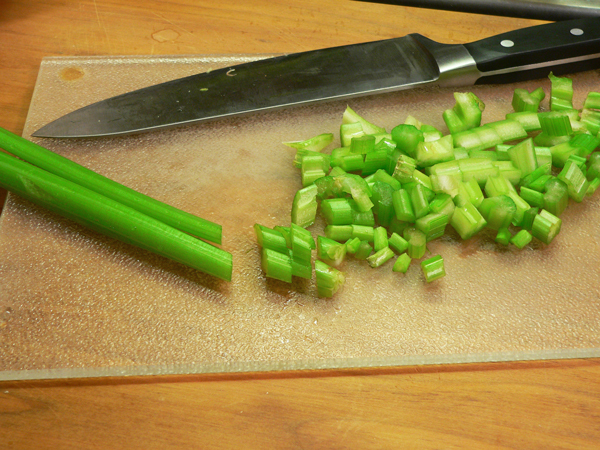 Dice the celery, add to broth. Dice the onion, add to broth. Cube the potatoes, add to broth. 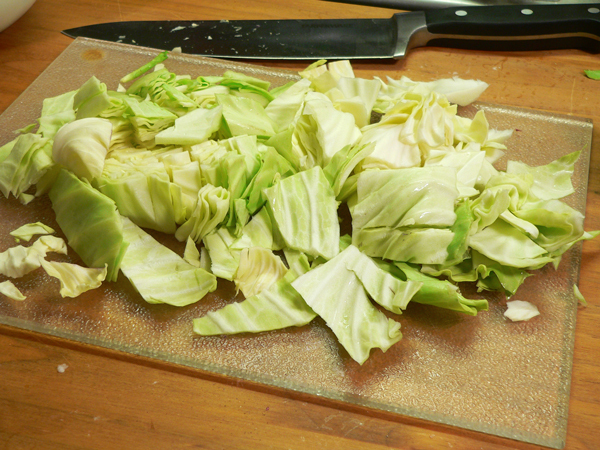 Slice the cabbage, add to broth. 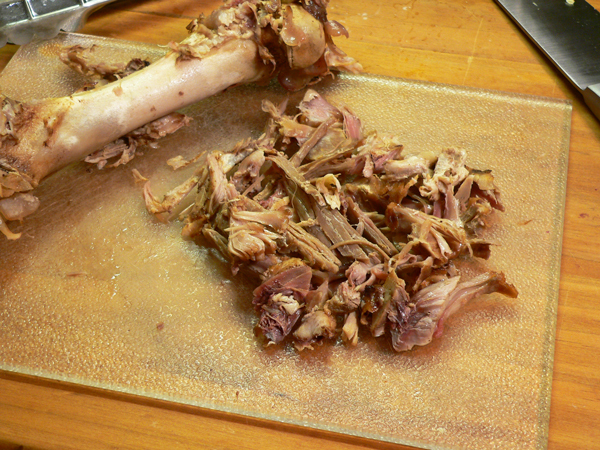 Remove meat from the ham bone, add it to the soup. Bring to a low boil, let simmer until all vegetables are tender. Taste and add salt or pepper to taste. If you don’t have a leftover ham bone, you can easily substitute a ham hock or some other type of pork seasoning to add to your broth. Use whatever vegetables, leftover vegetables etc. that you might have on hand and need to use up right away. Make it your own recipe. Your Comments: Have you ever made a Ham Bone Soup? Do you save your ham bones from your holiday hams to use later? Think you might try our recipe some time? My favorite to make with my ham bones is potato, have several recipes but usually just what I have to go in -onion cheese or velveeta, celery, different flavor potatoes, and season to taste. your vegtable and ham bone looks tasty, I will have a dilemma on which to make. My husband will enjoy this soup going to cook it Monday for him. We have had up and down temps here in Mint Hill, NC too, and about 4 inches of snow last week. Your ham bone soup is really needed at this time of the year. My Mom made one, but she didn’t put cabbage in it. Boy it sure looks good. I have been meaning to make some soup, just haven’t gotten around to it yet, but it is going to be cold this weekend with possible wintery mix, soup would just fit the bill. Thanks for your newsletters and recipes, keep safe in your trips. It’s been freezing cold here in South Louisiana too and we’ve had ice and snow twice this winter. Perfect soup weather. I enjoy reading about your week and the recipes you share. This looks great Steve. I’ll only be trying it next winter (our Highveld temperatures are in the 30s at the moment – that’s mid-upper 80s to you folk). I won’t have a ham bone, so I’ll probably use one or two Kassler chops. I LOVE soup in winter, it’s a real comfort food.